Velcro Attached! Bed Skirts made for an adjustable base and your mattress which is unique as it adheres to the motion of the base. 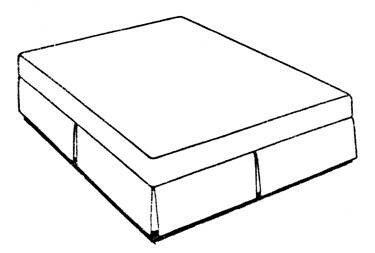 A platform sheet sits under the mattress and has a Velcro strip that allows the skirt to attach without removing the mattress. Just attach and detach the skirt as you need, either to change the color or to launder. 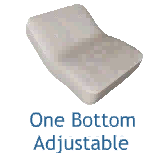 Customize the fit at the foot of the bed (Retainer Bar) by simply cutting a slit or going around the bars and reattaching with Velcro. Styles of shirred (gathered), tailored, or pleated. Machine washable. These bed skirts are unique and adhere to the motion of the base with a platform sheet that sits under the mattress and has a Velcro strip for the attachment of the skirt, itself. This allows the skirt to attach and remove without removing the mattress and added ease of laundering. Bed Skirts are lined for backing and extra weight, come standard with a 13" drop or you can choose a larger drop at checkout. Available in 200, 350, and 600 thread count fabrics. Machine wash and dry cool. No more moving the mattress! Made in the USA. Pick One... 10" 11" 12" 13" 14" 15" 16" 17" 18" 19"